An endoscopy is a test that looks inside the body. 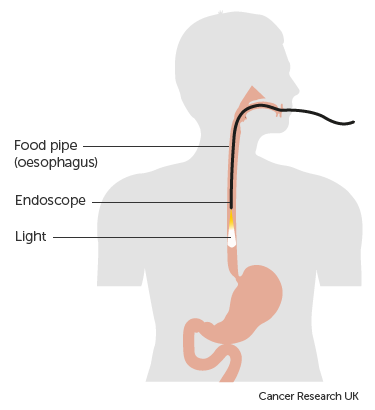 The endoscope is a long flexible tube which has a tiny camera and light on the end of it. This test is called a gastroscopy or oesophagho gastric duodenoscopy (OGD). If you have Barrett's oesophagus you'll have regular gastroscopies to check for any changes to cells in the lining of your food pipe. A doctor or specialist nurse (endoscopist) looks down the endoscope to see if there are any growths or other abnormal looking areas. They can also take samples of any abnormal looking tissue through the endoscope (biopsies).